Governance acts as the mid-wife for development. Accountable and responsive governance is the surest way for perfect delivery of the fruits of development. 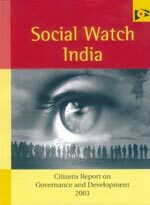 India's first Citizens Report on Governance and Development, brought out by The National Social Watch Coalition, attempts to check out how the Indian governance system can be rated on the basis of the above criteria. The report evaluates and assesses three fundamental crutches of the Indian system: Parliament and policy domain, Judiciary, and Local self-governance institutions. Consisting of a chapter on each on these segments, a group of specialists and activists has worked on each issue. The report, which is full of interesting details and comprehensive evaluation, concludes that the definition of governance must change in India. There are minute details of parliamentary debate and how much time the parliament spends on development issues. Not discounting the positive role played by the judiciary, there are facts to show that it may not be as effective in the future. Similarly, on policy issues it convinces that development of the poor suffers from less attentive policy implementation.